These files are in portable document format: pdf. You need the Adobe Acrobat Reader to view it. If you do not have this free reader, you may download it by visiting the Adobe website. Illinois History Teacher. This publication, produced by the Illinois Historic Preservation Agency, includes co-authored essays and classroom activities for grades six through twelve on selected Illinois history topics. The issues below relate in their entirety to the Civil War. The following are individual articles and lesson plans selected from other issues of Illinois History Teacher. Prairie Pages. This publication, produced by the Illinois Historic Preservation Agency, provides teachers and educators with curriculum materials for elementary age students. Harriet Tubman: Freedom Fighter, lesson plan out of Oklahoma for 2nd grade. Marching Into the Civil War Times: Little Women Past and Present, unit compares and contrasts the culture during the time period of Little Women to present day. Students go back in time to the Civil War and explore the impact the war had on the March family. Lesson addresses both history and literature. American History Teacher’s Collaborative offers a variety of lesson plans on the Civil War. Educational resources for teachers from the Sons of Union Veterans of the Civil War. Lesson plans for grades 4-12 related to the Team of Rivals exhibit at the Abraham Lincoln Presidential Library and Museum. Teacher resources also related to the Team of Rivals exhibit at the Abraham Lincoln Presidential Library and Museum. Teacher resources for the classroom and a visit to the Museum. Great Illinois Civil War lesson for grades 8-12, with very specific with objectives and questions from the Pritzker Military Library in Chicago. Lesson plan to help students learn the names and locations of battles of the Civil War and how each side had a different name for the same battle from the Pritzker Military Library in Chicago. Fourth grade lesson plan to help students synthesize information about one of the important Civil War battles by creating a battle cube from the University of Illinois at Urbana-Champaign. Four th grade lesson plan involving civil war photos from the University of Illinois at Urbana-Champaign. Eighth grade lesson plan addressing both language arts and social studies learning standards through the reading of a Civil War novel from the University of Illinois at Urbana-Champaign. National Archives offers numerous teaching resources. Library of Congress classroom materials on the Civil War. Special Library of Congress lesson introduces students to primary sources — what they are, their great variety, and how they can be analyzed. Index to Civil War teaching resources from the National Park Service. This site from the Civil War Trust has great teacher resources. The unit looks at uncertainty of Union victory, disease and sanitation, and the transformation of civilian life, particularly for white women and african americans. The site also has a neat feature to see how the unit meets standards from different states including Illinois. Site has several lesson plans and activities on the Civil War. National Archives site allows educators to find and create interactive learning activities with primary source documents that promote historical thinking skills. University of Oregon site designed to provide interactive and animated representations of fundamental historical problems or events. A Nation Drifts Apart, Curriculum materials for the 5th & 6th grade Tour the Home and neighborhood where Abraham Lincoln lived in the 1850s. During this 45 minute program discuss the issues leading to the opposing positions Mr. Lincoln and Senator Stephen A. Douglas held on slavery during the 1858 U.S. Senate race. Peer reviewed by today’s foremost Civil War historians, the Essential Civil War Curriculum contains essays, bibliographies and other resources on the 400+ topics which constitute the basic knowledge that should be possessed by any serious student of the Civil War. Civilwarinart.org makes nearly 130 works of art from seven Chicago cultural organizations accessible to teachers, parents, and students around the world. The Role of Women in the Civil War produced by the University of Houston in collaboration with the Chicago Historic Society and others. Lesson plan from San Bernardino County, California’s Superintendent of Schools’ website addressing the role of women in the Civil War that could easily be adapted for Illinois. Civil War Trust lesson plan on African American soldiers and the fight for rights and responsibilities of citizenship. Numerous lesson plans and activities on the Underground Railroad. 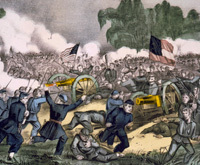 In early July 1863 Illinoisans joined others in the loyal North in celebrating major military victories at Gettysburg, Pennsylvania and Vicksburg, Mississippi. A small number of Illinois units saw important service at Gettysburg, while troops from the Sucker State made up as much as one-third of the army with which Ulysses S. Grant captured the crucial Confederate bastion on the Mississippi River. Copyright © www.illinoiscivilwar150.org All rights reserved.